February 2008 we downsized to a much older, smaller house. I felt a connection to the new house the second I put my foot on the vestibule floor. I cannot describe how or why I felt the way I did...I just did. It was the right size, the perfect location and it was in the price range we sought. There were also some lovely elements to the house, the original hardwood floors, all the original doors and trim and the original plaster walls and ceilings. It should be noted that the original bedroom trim and the doors on the inside of the bedrooms, were already painted white, which was fine with me. I immediately began to visualize where all of our stuff would go. The house needed plenty of work. A two storey addition was required which would allow us to enlarge the kitchen and add a master bathroom upstairs. We hired our contractor and had plans drawn up for the reno. Flash forward to June 2008. The kitchen was designed, new windows for every room and trim to historically match the profile of the original had been orderd for the addition. All of the doors and trim in the addition would be painted white. I began in earnest to start tackling every design and decorative decison that had to be made. I had determined that my indecision would not be the cause of delayng the project. And it never was. Budgets and timelines are always a factor. However, I began to have uncomfortable feelings about some of those same elements that had so endeared me to the house in the first place. The original plaster ceilings in the living and dining rooms had to go. They were cracked and could never properly be repaired. Down they came. I decided coffered ceilings would add to the upgrade quotient, while maintaing the dignity of our Craftsman-style house ....an added expense yes, but the right decision without doubt. But my nagging concern throughout the entire renovation was the original reddish brown stained trim and doors. My husband would not countenance having them painted and I wholeheartedly agreed...at first. They added an element of charm to the house. Over the course of our 3-4 month renovation, I was at the house every day. I was able to see the naked inside of the house with new eyes. Yikes, maybe this house was going to be a little too dark for my liking. Yes, the living room has a southern exposre, but the sunshine would be impeded by the covered veranda just beyond and the adjoining dining room faced north. 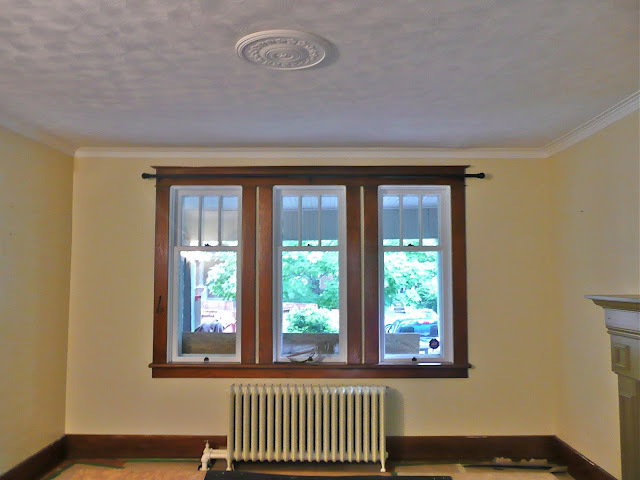 We were moving from a house that had charming white trim, chair rail and beadboard. It was so clean, fresh and bright by comparison. Eventually, l had to start talking myself into embracing the doors and trim. 'I will wait and see. If I really don't like them...I'll paint them later' or 'Once we get all our stuff in here, I'll probably really like the dark doors and trim'. The problem is, I desperately wanted to want to keep the original doors and trim, but for all the wrong reasons. Deep down I knew they had to be painted white. And this my friends is where I must stress.....DO THE RIGHT THING FOR YOU.....or else the ripple effect comes a knockin'. 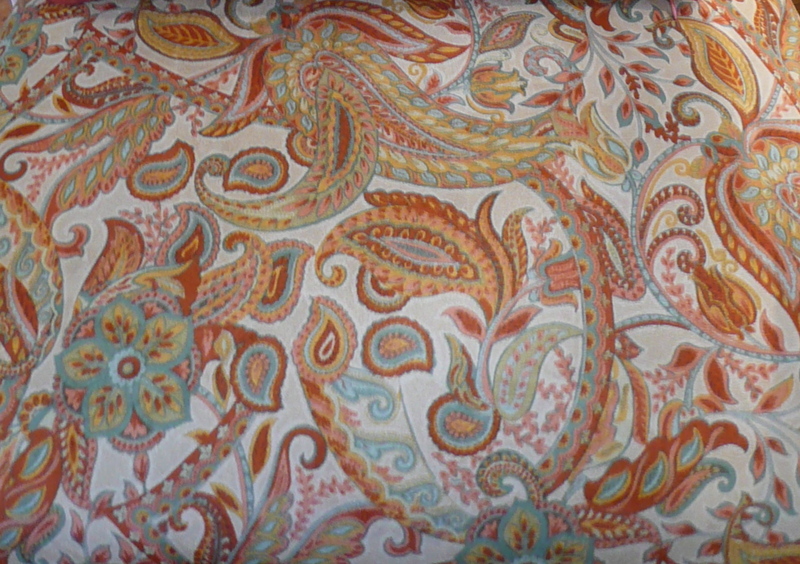 This is the fabric I chose as the inspiration for every other fabric and colour choice. 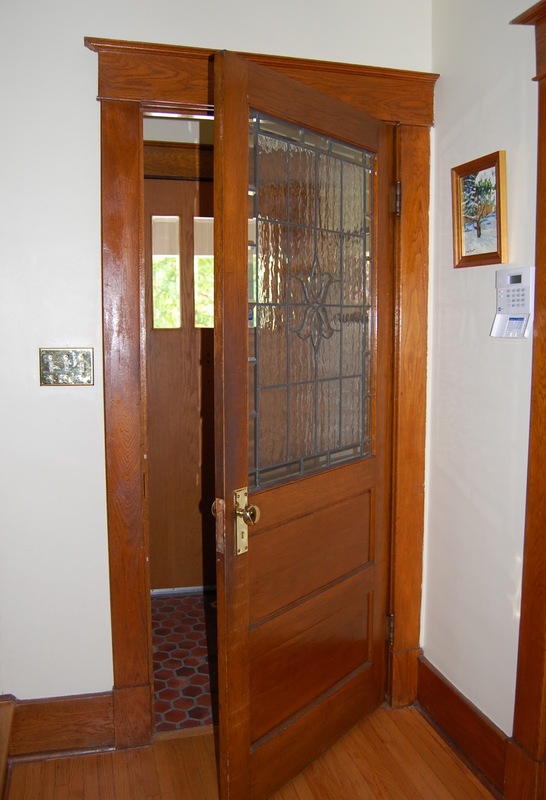 It went beautifully with the original reddish brown stained doors and trim. Every colour and texture choice I made for the living room, dining room hallway and adjoining kitchen was motivated by the original colour and ambiance of the trim. It was a huge factor in the finishes and the final look of all the ground floor rooms, the hallway, up the stairs and the upstairs hall. If I had done what I KNEW was right for us and our house at the beginning, I would have chosen colours, fabrics and finishes differently. Late August and moving day arrived. The doors and trim remained as they were. After we settled in and most of the decorating was done, I still had this niggling feeling that my house was NOT my home. I knew I had made a mistake. I actually found our house depressing and heavy. We lived for a year without painting out the doors and trim and then one day I decided I just had to do it. So I did. 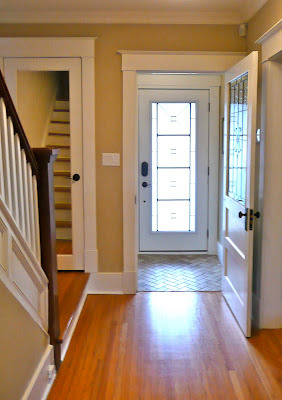 I sanded, primed and painted two coats of white paint on every single remaining inch the of brown trim and doors, except the railing on the stairs...discovering along the way that it was not in great shape anyway. It took me five weeks. Honestly, it was like I could breathe again. I was beyond happy with the end result. I realized, however, that I was not keen on the sofa colour I had originally chosen when the trim and doors were stained. If I had listened to my instinct and painted the trim and doors white, I would have then chosen a red fabric for the sofa. Due to my mistake, other colours and some fabrics choices had to be tweeked. The dining room was screaming to be repainted. I chose red. I won over all the doubters, particularly my husband, as soon as the hall was finished. Not one person questioned my decision. I have learned a valuable lesson that I want to impart to you. Always listen to YOUR inner voice...YOUR gut feeling. It may be telling you to take a different direction than you anticipated, but guaranteed, it is always the right choice for you.